When heading out on the road either for a quick family vacation or a long term adventure, you need to keep an eye on your budget. From fueling your vehicles, to places to lay your head, or to even the clothes on your body. 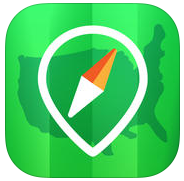 As our family dreams about that ultimate long-term adventure of RVing across North America, I’ve been looking into apps and ways we can save money along the way. Feeding and clothing four growing boys is difficult enough in today’s economy let alone when adding in the unique nature of being on the road. One of the biggest battles I face is with clothing. You’d think it would be easy having four boys and being able to hand clothes from one kid to the next. Have you ever met my boys? They hit the dirt hard and have never heard the concept of not tracking it through the house. Not only do they wear their clothes thin from playing but they all hit the seasons when they are in different sizes. So in our family hand-me-downs are not a great option for keeping the clothing costs down. But the clothes that others do not want are often like new, no wear, no tear, no thin knees from crawling around pretending to be a dinosaur. However, thrift shops are a hit and miss type of shopping trip. Finding solid clothing in the size and season we need isn’t always successful. When you do score it’s often big – thick Levi’s for only a dollar or two. So when I need certain items and I can’t wait to score big at the thrift store I hit up my favorite retail shop – Kohl’s. You may be asking why I don’t go to some of the other box stores known for their rollback prices. 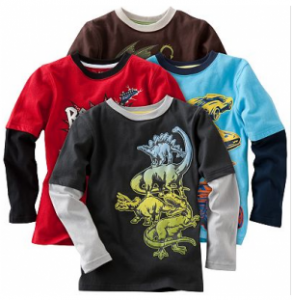 Many times they don’t have what we are looking for as the boys’ section is typically one or two racks. Also, the clothes that are there in mass is the store brand that uses thinner, cheaper material. I love that we can find the well-made brands with stackable coupons and sales. Using the sales and coupons I have walked out of a Kohl’s with a number of LEVI jeans for about $20 that will last through all the rough, dinosaur playing. Besides our never ending battle with the clothing, my other big concerns are keeping fuel in the tank and the bellies. Also, free places to park. A little digging found three amazing apps that will help us keep on track with our budget and still be able to create memories. 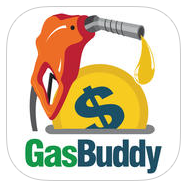 Helps you seek out the cheapest gas in the area and it also looks like they do prizes for helping them out by submitting/confirming gas prices. For when you need to save sanity and not have to cook yourself it’s nice to eat out every once in a while. 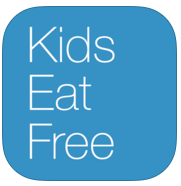 Finding places near you that the kids can eat free is often key to affording feeding four growing young boys. So you have the RV or all your tent supplies but now it’s time to find free spots to camp. Camping on US public land is a great way to truly experience our beautiful country and avoid all the touristy campgrounds. There are many other ways to save when on the road – but for now I’m thinking of the key items that are going to be make-or-break for our dream to travel North America in an RV. The gas for our truck, the place for us to park, being able to eat out at local restaurants and keeping ourselves dressed in quality, lasting clothing. What ways does your family save when on the road? Great article. Healthy and useful post. Great topic for a post! We travel a lot and for us preparation is key. Staying in apartments instead of hotels allow us to cook at home. Grocery shopping is often a great part of the adventure! Once I bought what I thought was a Prego type spaghetti sauce turned out to be unseasoned plain tomato sauce. LOL! That was terrible. LOL! But, even if you don’t want to do much cooking, you can buy cereal and milk and have a quick and super cheap breakfast before you head out. This can save a great deal for a family over the course of a vacation. Another simple thing we like to do is buy snacks for evening time – like a bedtime snack. We easily save $100 a day with snacks and breakfast with coffee in the apartment instead of out. We always travel with the kids and strive to make it educational. We are raising global citizens just like you! Great tips! I like the apps you shared, I’ll have to get those. Hello Alaina. Just stumble upon your blog while looking for baby information. First of all, this is a great blog and I love the way you write. I was reading your opinion on “saving money on the road” and I have to agree with what you said. Although I do not have 4 kids like you but I do agree that doing proper budgeting is crucial especially travelling with kids. Budgeting not only on dollar & cent but also other stuff like clothes, food and etc. Would love to read more of your blog. Let me know whenever you have a new update and I will come back checking 🙂 Good day! A tip that I personally follow is use old jeans and cut them just below the knees, and these can become my camping shorts. I don’t have to worry about them getting dirty either, just toss in the washer and wash like your regular clothes. We shop at Kohl’s for our 10 year old daughter. They always seem to have nice clothes at reasonable prices. We also shop at Justice. They recently did away with their fake sale pricing, and now show you the real price and don’t do the sales. I like it a lot better that way. It think it’s only girls clothes there, so it won’t help with your boys, but our daughter really likes the styles there. Eric West´s last blog post ..The Ultimate Ting Review 2016 – Is It Time to Change Wireless Companies?